Hello, I dare not show my face when I have lots of fantastic makes coming up almost every day! Here is me today with a teen card. Usually I run out of ideas when it comes to a making a card for a teenage boy! Then I remembered Gummiapan stamps has a solution for every occasion and it didn't take me longer to find what to do. So I got the board skating boy, what's next?! I decided to use the Gummiapan splash stamp and create the background. Only 3 Distress Inks pad I used. 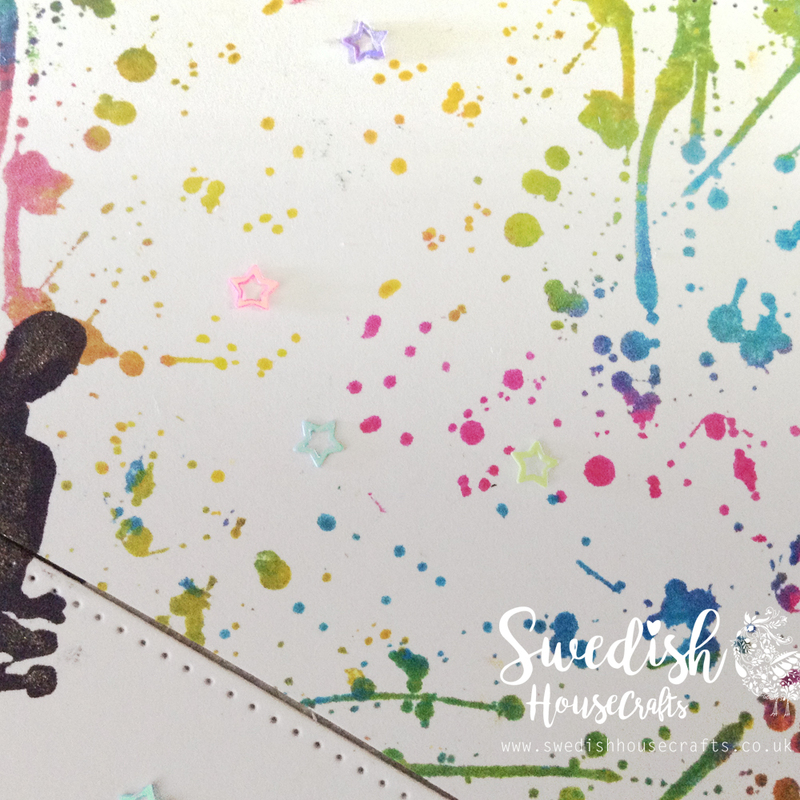 The simple reason is that I stamped them together which allowed the colours to mix and create more colours. Did you know that it is not how many colours you add but when. I diecut 2 frames from Roxstamps pierced square dies and I decided to integrate them because I forgot to mask the background for a place for the sentiment, ha! typical me. I plan one thing and it ends up something else! The Tim Holt Platform has exceeded my expectations, at first I thought it is just another copy of Misti. Well, it is, but I loved 2 things about it, the card didn't move at all while stamping when I forgot to use the magnets (very strong magnets BTW) and the other thing is that I didn't have to put any extra pressure (when I did first, I smashed the stamp and inked around it, of course this is an issue that depends on the quality of the stamp too. The Gummiapan stamps are thick and firm, which is the 2 major things to look for when buying stamps. Compare your brand stamps with cheaper ones, you will get what I mean. I brushed the board skater boy with Wink of Stella brush glitter black and added mini sequins. So with scissors I cut the diecut squares, I should have used a craft knife for a cleaner cut and fit. I'll do that next time. Then put them together. When I created the background, I used only 3 Distress Inks colours and let them make the mix by themselves. Can you see the little stars? go the Poundshop and grab some, they come in mini bottles, 8 bottles for £1! they are awesome and cheap. I hope you like it and thank you for passing by, don't forget to follow the blog for much more exciting makes and surprises. Great card! What a fabulous background for that skateboarding stamp! Wonderful design!